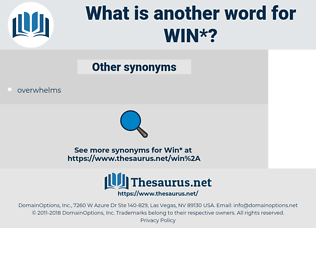 What is another word for win? attain success or reach a goal; " The enterprise succeeded"; " We succeeded in getting tickets to the show"; " she struggled to overcome her handicap and won"
does a bang up job. attained, are, AM, prevail, Got. lay, enlist, convince, regain, prevail, persuade, elicit, defeat, capture, seize. decline, deter, slip, flop, warn, rout, slump, drive away, overthrow, damp, wane, repel, disaster, chill, setback, upset, lurch, washout, debacle. give up, spend, let go, depart, dissuade, release, pass, misunderstand, leave, throw away, ignore, discourage, neglect, free. You would win me, if any one could. 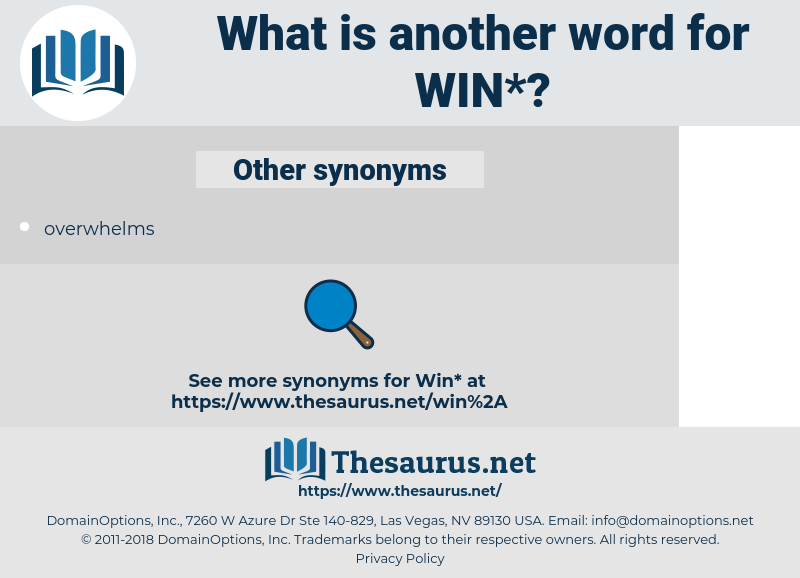 weeny, whim, whine, winnow, wine, wayne, weenie, wane, wnw, Winn, wen, wean, Winne, wmo, Wynne, winey, woman, wham, Wynn, whinny, whiny, won, WINO, wynnea, wain, whammy, whin, wan, when, whiney, Wuhan, winy. prevail, sweep, carry, take, romp, triumph, take the cake.